Nourish has 3 locations in the Houston area, and one is also a coffee shop (bonus). This is a no brainer for me. I love a great smoothie or juice spot, but seeing as this is located directly outside of Method Pilates (you literally have to enter Method through the Nourish door) it makes sense to grab your post workout fix here. Lots of GF, DF, V options here, along with a nice little section of grab and go foods. If you’re going to Nourish and Kalos, they also have a small menu of freshly prepared foods along with a larger assortment of grab and go’s. Located off Richmond St near Upper Kirby, but anxiously hoping they open more spots because yes, it’s really that good! If you want an incredible smoothie bowl, this is your place!! The toppings are amazing, and if you don’t like what you see on the menu, simply make your own bowl and top it with your favorite toppings. I really love that you fill out a piece of paper with your order so you don’t annoy the staff when asking to sub a few ingredients in the base and add about 20 on top (guilty). So I love this spot because it is the same people behind Juice Well! 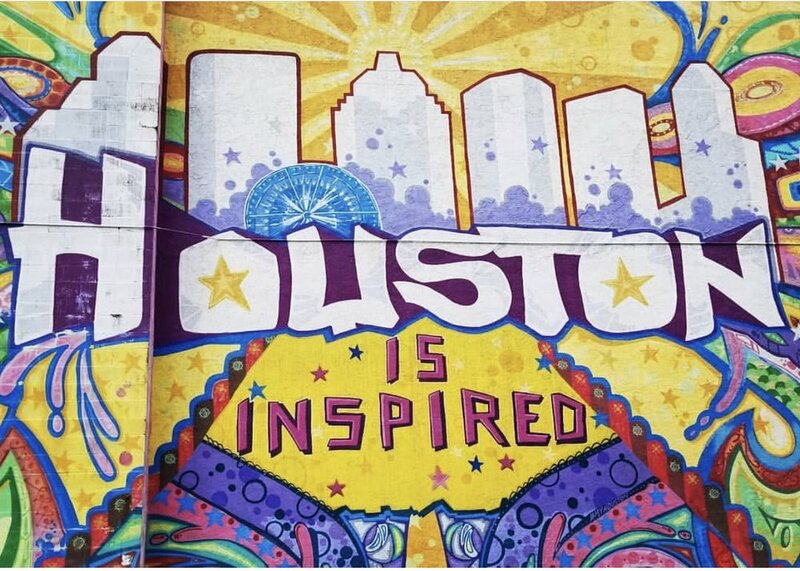 It’s conveniently located in Bellaire for those of you who aren’t located or staying in central Houston (they also have one in Chino Hills, CA if your travels find you there). Again, order one of their popular smoothie bowls and choose between pitaya or acai or make your own, lots of smoothies and cold pressed juices to choose from too. Whatever your tummy is craving, this place is here to satisfy in a healthy way! Can’t get enough of this place or Juice Well! This is a chain within Texas and also has a location in Brooklyn, yes Brooklyn new York. I really, really love this place. Again, two of them in the Houston area are located inside another WT4K workout spot, so you get your workout and post workout without having to drive to another location, seriously, score! They have tons of GF, DF and Vegan grab and go items, I seriously could eat them daily. I love this place because it was the first juice bar in Houston that I found and loved-oh and everything is organic!! My favorite smoothie also inspired my favorite make at home smoothie/smoothie bowl. They have tons of fresh smoothies and juices and a small selection of grab and goes and a daily soup. The people here are so sweet and you can tell they really love their jobs and turning people onto new things! With three locations in the the Houston area, this has quickly become one of my regular spots. It’s quick, healthy, farm to table and just delicious. They serve breakfast lunch and dinner 7 days a week (brunch on Saturday & Sundays). They have tons of GF options and it’s indicated by a nice yellow “GF” dot next to all the GF items and they have fresh cold pressed juices. They offer beer and wine and a small patio that is amazing to relax on in the fall and spring (let’s be honest, it’s way too hot to be outside eating in the summers in TX). You order at the counter, and get a number and then they bring your food to you, no need to clean up after yourself, they take care of that too. For brunch you see a hostess and are seated, get there early though because this place fills up for the weekend brunches! Local Foods has 5 locations throughout Houston. They’re super cute with great patios to enjoy a drink with your healthy lunch. It’s a favorite for Houstonian’s and you will see quite the line around lunch time at all of their locations. They have online ordering which comes in mighty handy in a rush and it’s ready in 15 minutes! They have nightly specials that range from tacos to sandwiches all the way to short ribs and chimichurri roasted chicken. Indian Food done authentically and incredibly well, they also have a full bar and extensive wine menu. They start by serving a medley of fried veggies, and let me tell you fried kale is now one of my favorite things, ever! Don’t worry, this is GF. In fact, most of their dishes are naturally gluten free. They offer two different types of gluten free naan. The texture is a little different than typical naan but it tastes like a fluffly, savory pancake. They also have a tasting menu if you wan’t to really get a taste of their extensive menu. The staff is incredible and so kind and are very helpful when it comes to making sure that whatever you’re ordering is gluten free. Kheer for dessert (rice pudding topped with pistachios, I love me a good rice pudding)! This Indian spot started in Houston and now also has a home in Brooklyn. You may have heard of this place as one of their desserts, Chai pie, made the List of New York Magazines Crazy Awesome dessert feature. My husband swears it’s one of the best things he’s ever eaten! Chai pie aside, I really love this spot. They have the main restaurant on the first level and then another stand alone spot called the Bake Lab. I love running to the bake lab for a quick GF treat or for breakfast served in a cute little skillet. They have lots of gluten free options and put Indian spins on some of your favorite items. The Bake Lab serves Breakfast, Lunch and early dinner (closes at 7pm). 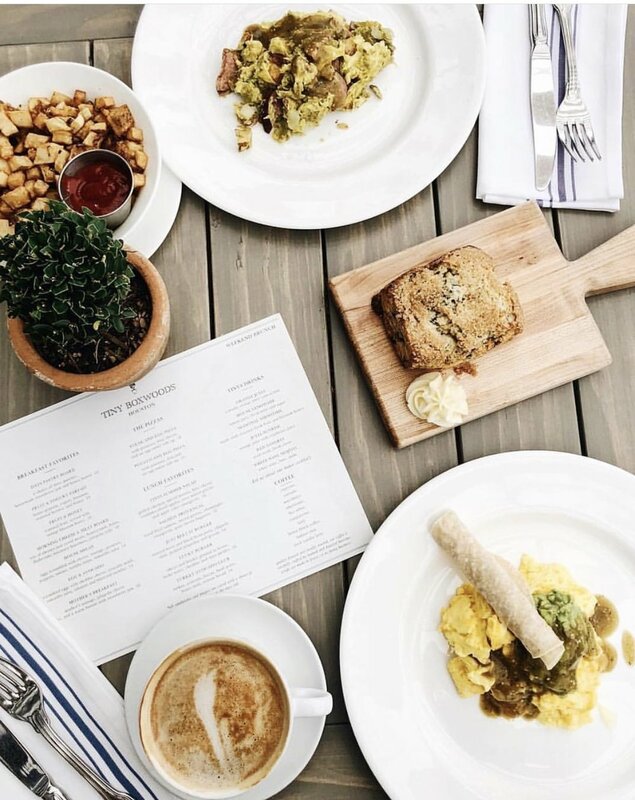 Their menu changes seasonally so I like to stop in frequently to see the new menu items, I typically go for breakfast, or to grab a sweet treat and afternoon coffee, no alcohol. Pondicheri serves breakfast daily 8am-3pm, lunch 11am-3pm & dinner 5-9pm, full bar. Sushi, you either love it or hate it. I for one, love it! And Kata Robata has made me love it even more! Their fish is incredible and always fresh. They have a large selection of gluten free options including their soy sauce and many of their marinades for their cooked items. This place is very unassuming and straight to the point. The staff is super friendly and very knowledgable about their products. Sit at the sushi bar if you can! Their bento boxes and rice bowls on the lunch menu are seriously crave worthy! This always busy gem is now also in Austin, Dallas and Denver. Make sure you make reservations in advance or you will be waiting till the very end of the night to eat, it’s worth it, but I know not everyone enjoys super late night dining. Extensive GF list and just really great food and sushi. Their nightly specials are really a treat and usually can be made gluten friendly! Okay, this chain is starting to make it’s way around the country, thank goodness! I may love this place because I grew up in Iowa and so did the founders or I may love it because it’s really just that good, did I mention it’s also locally sourced and GF?! Think coldstone creamery of popsicles, only everything is GF and locally sourced and hello it’s on a stick, what could be better?! 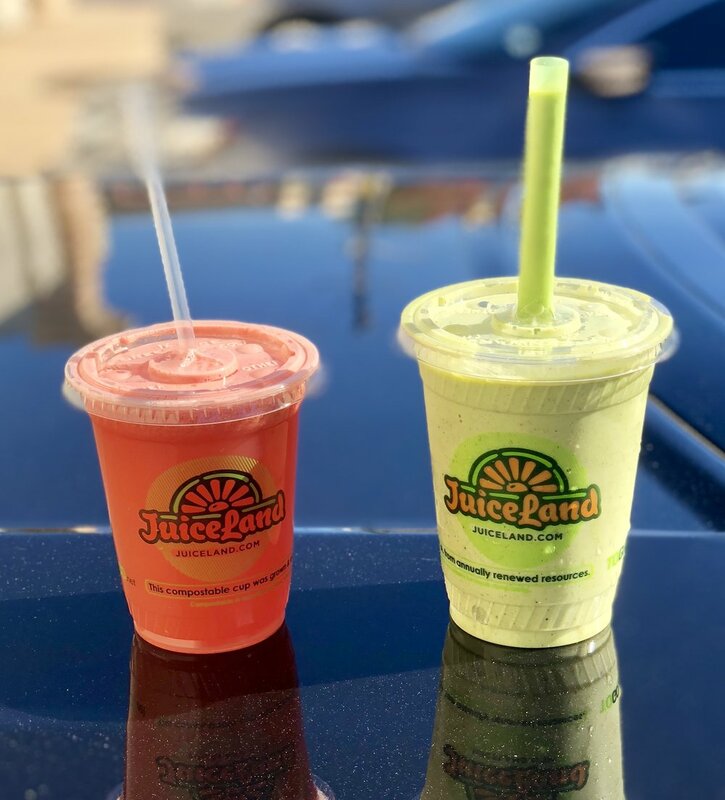 Conveniently located near the Galleria this is a great spot for a quick juice or smoothie or a hearty salad or healthy snack and happy hour drink with friends. While their pizzas are not gluten free, they have tons of salads, dips and snacks that are! They serve wild-caught shrimp, hormone-free chicken, cage free brown eggs and local ingredients when available. I love not having to guess when it comes to quality and this place really nails it. They also have calories listed in case you’re into that, sometimes I think ignorance is bliss. *Check out their awesome happy hour! Great for lunch, dinner or a low-key date night. This may be my favorite place in all of Houston. Grab a table outside in the garden or peruse the nursery and shop next door after you finish your lunch. Grab one of their cocktails or mimosas during Sunday brunch. They have an afternoon menu with small bites that can be enjoyed from 3-5pm, if you’re not super hungry I suggest grabbing a friend and a glass of wine during this time, it’s quiet and beautiful! It’s also the perfect date night spot, grab a seat outside and enjoy the Italian lights and the beautiful bulbs throughout the garden. This place is really a gem! While I’ll admit their cheese boards and picnic boards do not offer gluten free bread, they’re amazing sans bread! If you’re not GF, make sure you try their breads and pastries, they’re incredible! We love Tiny Boxwoods and find ourselves there at least once a week, it’s our go-to when we have friends in town. Days catch with coconut rice! This is the sister location of Tiny Boxwoods in West U, it’s equally as cute and offers a nice outdoor space with a different (yet very similar menu). They even have a shop on the side, Tiny’s Milk & cookies that has incredible cookies (not GF) and ice creams on the go! Cutest little coffee shop in Montrose with great breakfast items (served till 5pm) and beer and wine for when you need more than just a caffeine kick. I absolutely this little spot. 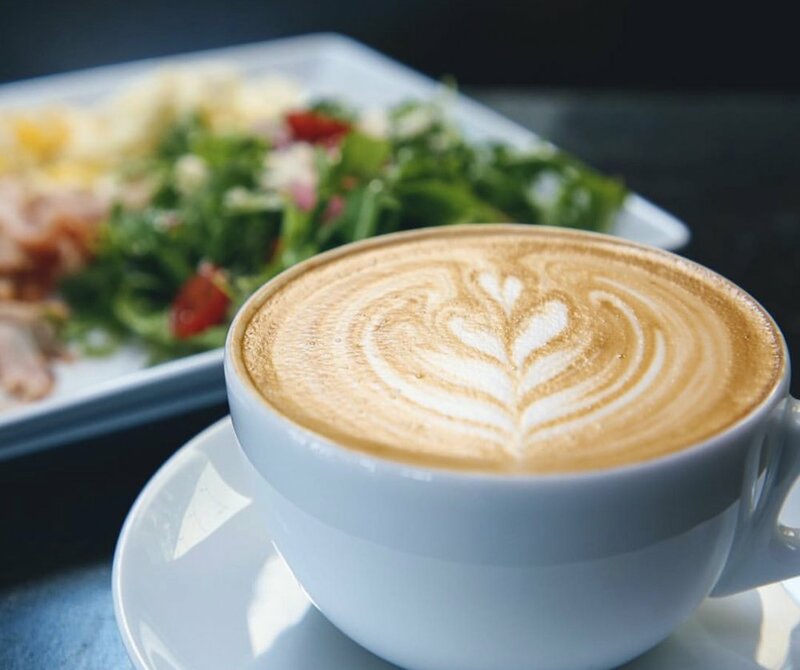 It’s perfect to cozy up with a cup of coffee and your laptop and get work done or to grab a quick bite on your morning commute and surprise the office with some fresh pastries. Although they do not have a dedicated gluten free menu, there are plenty of offerings that are gluten friendly on their own if you skip the bread. Don’t let the name fool ya, they are doing SOOO much more than coffee! While I wish their incredible toasts came as a GF option, unfortunately they don’t! But Try the tacos as a bowl, ditch the tortilla, promise you won’t miss it! The tomato basil soup is awesome among other things. Oh yeah, the coffee is bomb too! If you’re not gluten free, please eat all the toasts and let me know how they are! Pho is kind of an obsession in our household, so is ramen, but it’s much easier to find GF pho than ramen since they often use rice noodles. This is located right next to an orange theory so if you have a killer workout and need a pick me up, this is the perfect spot! Make sure and ask for a side of chili oil to dump into your pho, it put it over the top! I also like that the toppings (jalepenos, limes, sprouts) are serve yourself so I don’t look crazy when I ask for a mound of jalepenos. Chicken Noodle Soup (the chicken is shredded which I LOVE)! If you like vietnemese food and a great atmosphere than this is your place, they also have one in Chicago (have I told you how much I LOVE Chitown?!)! The food is amazing, with lots of gluten free options and if you go on a beautiful night (aka NOT summer in Houston) the large doors are open connecting the patio to the main dining room, with the lights from the river oaks district in the background, it’s really magical. You can also keep the night going by heading upstairs to hear live music or the DJ and have cocktails in the lounge. This was the first restaurant in Houston we loved! It is situated in a neighborhood and in a beautiful restored home. If you have been to Barcelona then this restaurant is a real star! They have an entire Gin and tonic menu, every single one is delicious and probably the most refreshing cocktails you’ll ever have. 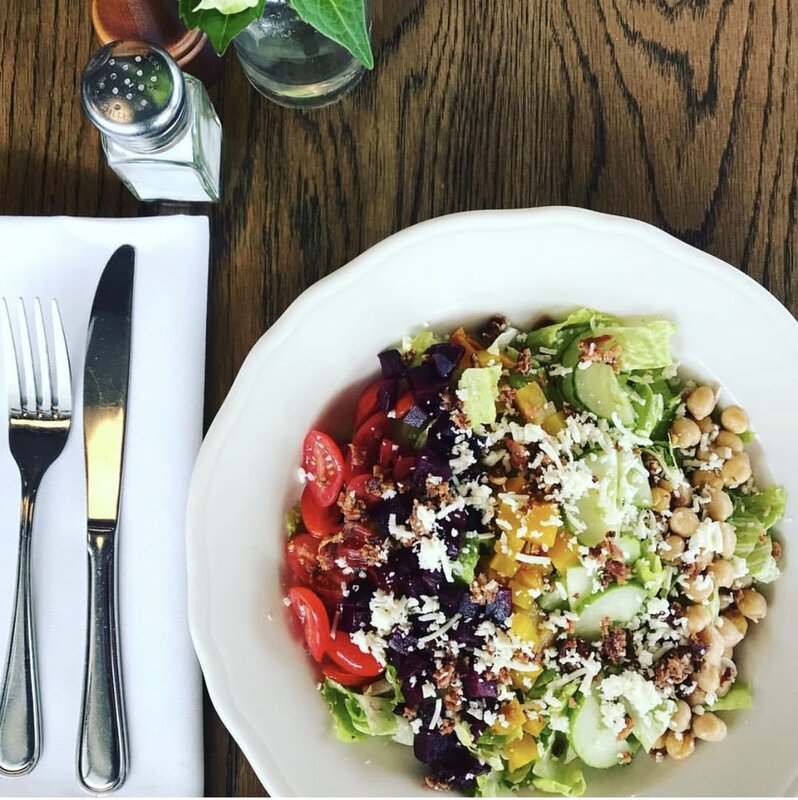 The menu changes often to incorporate fresh ingredients and the staff are incredible, and you can tell they love their jobs and to see you enjoying your food and sharing stories. They’re adding a new location in the River Oaks district, I can’t wait to try it, but I have a feeling nothing will beat the charm of the original BCN! This is the kind of place you want to go sit at and take pictures of your food while having a cappuccino and a glass of champagne. They have a great patio and it’s conveniently located! They do breakfast 5 days a week and brunch on Saturdays. I find myself stopping in the most during lunch hours because I love to bask in the sun while enjoying my salad. They don’t have a ton of gluten free options (aka no pastries, bummer) but it’s easy to make small tweaks to have plenty of GF options. Oh and did I mention they have a great wine list?! You know my love affair with this restarurant. Most of their dishes are gluten free and their gluten free pizzas are incredible! I love that it’s a great meal and you don’t feel the guilt of eating out and cheating on your diet here. Okay, I know you’re probably like hunh? Honestly their GF pizza and now their cauliflower crust pizza are honestly something to write home about! My favorite pizza is spice pepperoni with serrano peppers, pineapple and if I’m feeling real fancy truffle oil. That on a cauliflower pizza may change your life, it did mine! We often find ourselves eating out late, which isn’t the easiest thing to do in Houston. 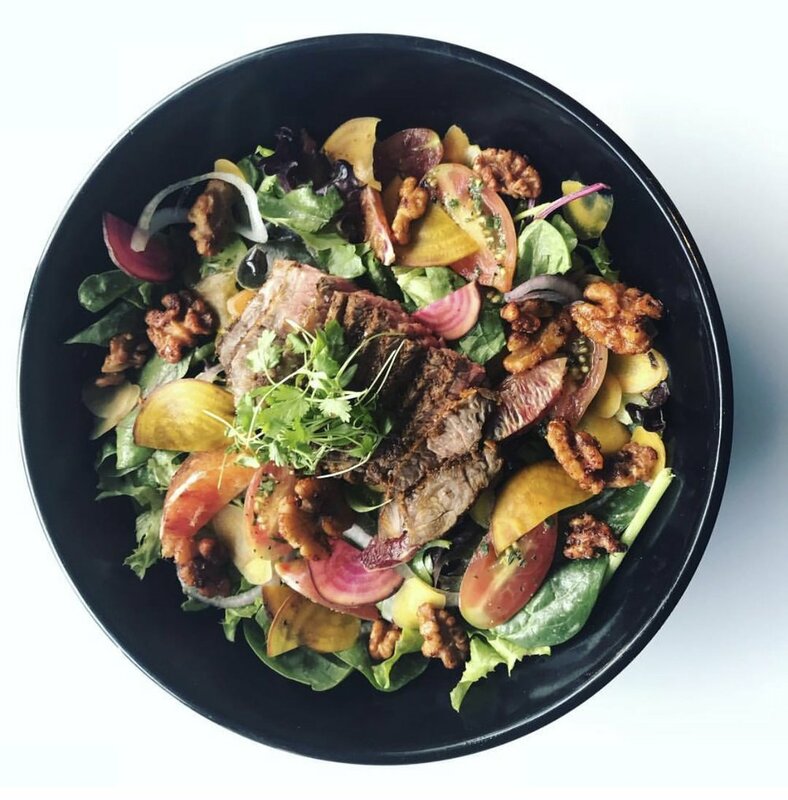 Steak 48 is open late and it satisfies the healthiest, and most unhealthy cravings alike. I love the beautiful/lively atmosphere and the staff is simply incredible! Again, a great late-night spot complete with incredible live music! I love how you know what you’re going to get every single time! The food is amazing and so is the staff! They’re super aware of their menu and dietary restrictions and even have a GF menu.